Gee, Marco... Somehow I don't think that the "wounds" are very "healed"... But I also care very little. Just another article democrats can gather at. CALIFORNIA, he's all yours, your party is going to need someone to appeal to the Latinos, you guys think your message is the problem, lmao. This is a perfect example, you can't even find the brass to vote on your own bill, then blame the other side. Yup, were so stupid we haven't figured out he was doing what his bosses told him too, if you can't successfully block huge numbers, you soon will be irrelevant. I think Rubio better WORRY about KEEPING his own seat in Florida in stead of campaigning for DISFUNCTIONAL GOP canadates in other states????? Let see , who does Rubio represent in OUR STATE of Florida???? The teaparty AND the Cubans , that's it !!! Kick this loser out in his next election in 2016 and give him a double LOSS!!!! "Still, Rubio brushed off questions about his presidential aspirations in a session with reporters, giving them a pat answer about waiting until after the midterms before making a decision about a White House run." Yeah, well. It doesn't take much to get GOPerville all flushed and star struck. Nor, I think, does it take much for the media to drool over that which isn't going to happen in GOPerville. That being said ... kudos for cutting and pasting Rubio adviser's meme (and faxed memo) heralding Rubio as the next best thing to ... well, whatever it takes to get GOPerville all flushed and filled with anticipated excitement. Somehow, I don't think Rubio is all he's worked himself up to be on that coveted national level he's trying so hard to break into. Nor will he ever be a national shrine; either as a moderate ... a conservative ... or a Teaper. 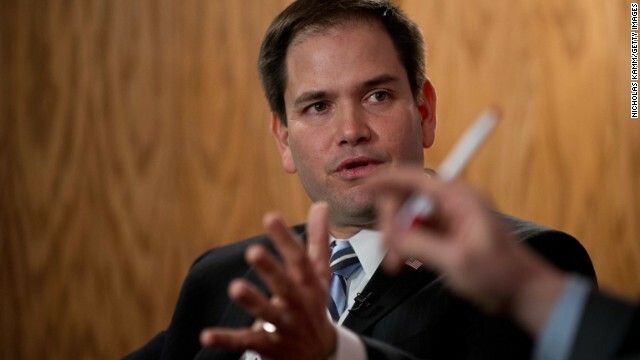 In basketball, they have a name for politicians like Rubio.... ... self-checked. I would rather walk with the waterboy than ride around in that dem clown car without any i.d. and get i.d as a clown . ""I couldn't think of a better way to make Rubio look good in South Carolina." Oh look! It's the poster boy for Big Sugar and the Tea Party. 635 – I think Lynda was merely pointing out the hypocrisy that the RWNJs are so famous for. Can you belive that the old S.C. geezers were the only ones there. They are still stuck in the old days. Let's just hope that they are not spreading their hatred disease amoung their off-springs. I am from Anderson and I can tell you that the only thing that has changed is the landscaping. The young blacks and whites in Anderson hang out together and do not believe none of this BS the GOP are selling. Only the old geezers believe it out of fear and hatred. I wonder did they ask Rubio was he a communist since he was not born in America? Rubio can give it up because for one he is not white enough and the GOP are not letting him win anything. Romney was white enough, but not Christian enough for their taste. The GOP is dying and they can't see the forrest for the trees.